This is the October 2014 review for From the Lab even though it is now November. Something happened and the boxes got out really late this month. On the website, it does say that even though this month was late, whatever happened got fixed and the November shipments should be right on time. Yay! 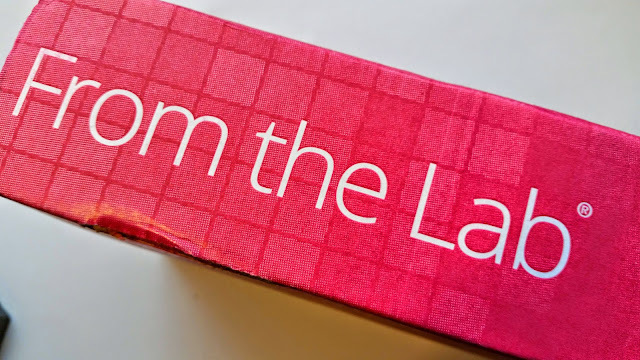 From the Lab is probably one of the most unique subscriptions you'll find today. They have partnerships with the best independent cosmetic laboratories around the world and manage to give us a taste of some of the most ground-breaking products before the prestige beauty brands introduce the same product for a much higher price. What You Get: Each month you will receive up to two 30-day supplies of the newest European quality luxury beauty innovations in the categories of skin care, hair care, and color cosmetics. Each selection has never released in the U.S. and sent to you up to 18 months before the same actives or formulas will be on retail shelves. From the Lab’s products are fully tested and approved using strict European standards, which often prove more stringent than U.S. standards. From the Lab products contain clinical concentrations of actives and only use clean ingredients that are free from cruelty or animal testing. So you can feel comfortable using From the Lab products! This month there is only one product and since we've been totally spoiled the last few months with multiple items, I'm not complaining! It's an interesting product, too. 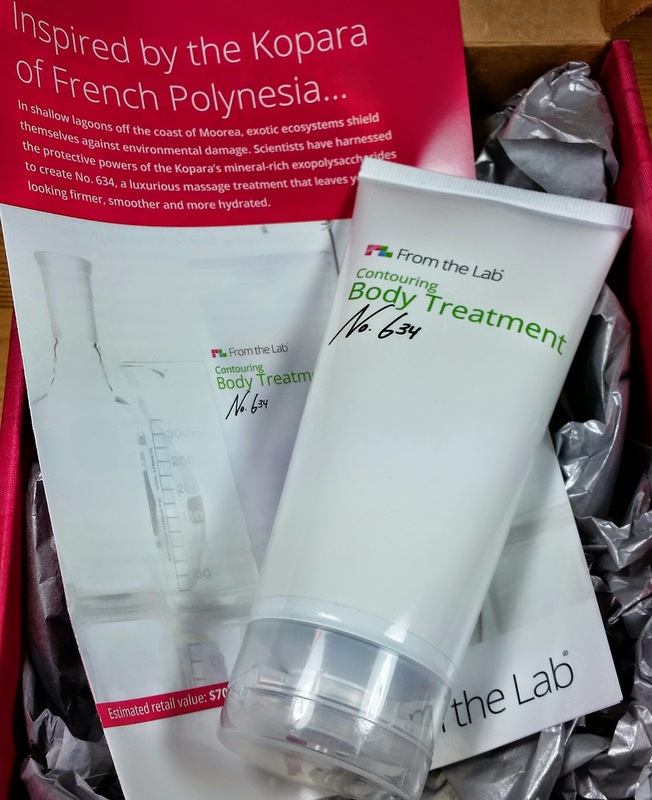 From the Lab Contouring Body Treatment No. 634- This is a luxurious massage cream that nourishes, hydrates and remodels to give you smoother, firmer skin. The exopolysaccharides help skin maintain optimal levels of hydration by stimulating production of hyaluronic acid and the protein Filaggrin. 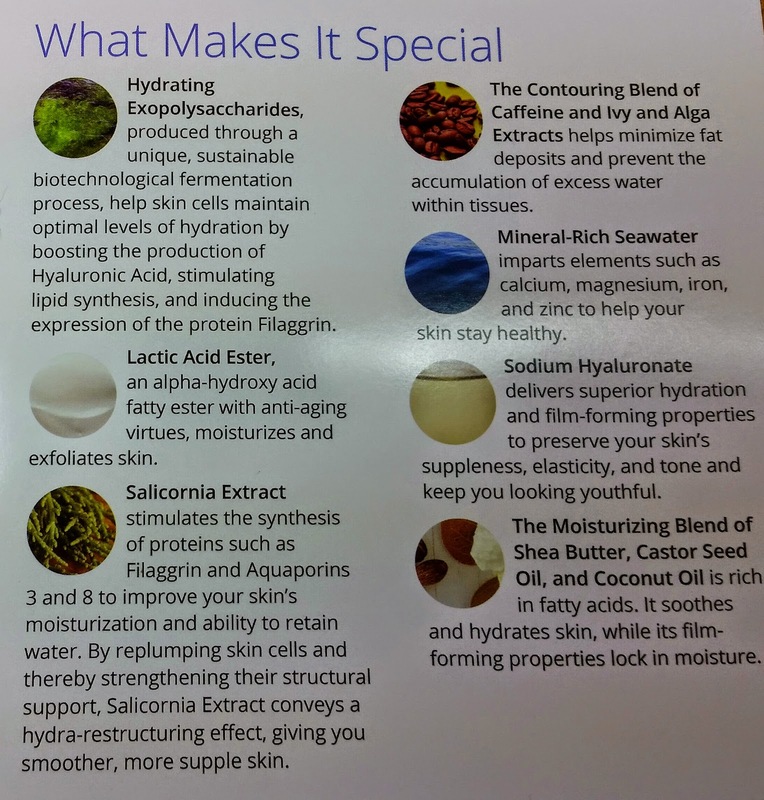 Another ingredient, Salicornia Extract, is clinically proven to improve moisture and water retention levels. It also contains caffeine which helps get rid of excess water. This has a sticky sort of texture out of the tube and even though it feels like you may need more, continue to massage. The texture changes and becomes silky and will glide onto your skin. VERDICT: This isn't going to make me skinny (sadly) but it does hydrate very well. I've noticed I've been a little ashy lately and this is very moisturizing and keeps my skin from flaking. This is made with shea butter and coconut oil and with ingredients like sodium hyaluronate and vitamin E, I'm pretty happy. Plus it's fun to try things no one else has! This is one of the fun things about From the Lab! New stuff! You aren't a guinea pig, though, don't worry! These have all been tested and are ready to be put on the market when From the Lab chooses them. Remember, ALL From the Lab products use a conscientious selection of plant-based and synthetic ingredients that are suitable for all skin types. There is NEVER testing on animals and no substances of animal origin. From the Lab formulas are free of parabens, benzene, formaldehyde-releasing ingredients, irritants, nanoparticles, paba, phthalates, sodium lauryl/laureth sulfates and other comedegenic actives. If you would like to sign up for From the Lab, you can do that right here. Try coupon code GET30FREE. I'm not sure if it still works but if it does, you'll get $30 free to spend in their shop at member pricing. And one more thing! If you hate what you get, you can return it! This is so rare among subscription box companies, I still can't believe it. But if you hate a product, From the Lab accepts returns! Their customer service is phenomenal and utterly sweet. I love what that says about this company!